Whether you’re healthy and simply need more energy or suffer from chronic pain and fatigue, MitoSynergy can help you improve the quality of your life and help you take control of your discomfort and pain. With a one of a kind blend containing the patented Cunermuspir Complex, MitoSynergy can dramatically increase your energy and help to relieve your pain and discomfort. Check out this amazing censored video showing how our patented bioavailable Copper One helps eliminate harmful bacteria from your body plus boosts your immune system. MitoSynergy’s focus is to help the body help itself by feeding Cunermuspir to the cells to support the mitochondria in synthesizing ATP. The combination of our blends with Cunermuspir may help where other nutritional supplements have failed. Once you try MitoSynergy, you will want to share the results with your friends and family. MitoSynergy Advanced is our Signature all-in-one patented neuromuscular health supplement. We had an interview with Charlie Barker who is the inventor of the world's only bioavailable copper. It's called Copper (I) which is not the normal Copper II (blue) found in every copper supplement on the market! Copper (I) supercharges your immune system using knowledge first discovered by ancient Egyptians. Charlie began working with people from Egypt when he first heard about this new copper that gives up an electron to boost every cellular system in your body! These Egyptians had figured out a way to make bioavailable copper that did amazing things for the immune system. But there was a big problem. It only remained stable for a month before it oxidized into worthless blue powder. You can't have a product that only stays stable for a month! Blue means it's oxidized and worthless to the body. Blue oxidized copper won't do ANYTHING good for you. In fact, it could give you Alzheimers according to some new findings! Every product on the market that contains copper has the oxidized (blue) form in it! BAD stuff! Lyme Sufferer Gets Relief From 1st Bioavailable Copper! from Truth Warriors on Vimeo. There are numerous health benefits of copper. These include the proper growth of the body, efficient utilization of iron, proper enzymatic reactions, as well as improved health of connective tissues, hair and eyes. It's also an important part in preventing premature aging and increasing energy production. Other benefits include regulating heart rhythm, balanced thyroid glands, reduced pain from arthritis, quicker healing of cuts and bruises, increased red blood cell formation and reduced cholesterol. The health benefits of copper are crucial for maintaining an overall healthy life. This mineral enables a normal metabolic process in association with amino acids and vitamins. Copper cannot be produced by the body and therefore needs to be added from other sources. It is the third most prevalent mineral in the body and is mostly carried by the blood plasma protein, ceruloplasmin. In order to enjoy the health benefits of copper, it must be included in your daily diet, as it is used up in daily bodily processes. Mito Up at MitoCopper.com from Truth Warriors on Vimeo. Copper plays many important roles in maintaining a healthy body and mind. The benefits are too numerous to mention however we will focus on the most common ailments and irregularities copper can drastically help benefit. Helps Ensure Proper Growth. Copper is essential for normal growth and health. Thus, it is very important to include this mineral in balanced levels in your regular diet. It is also beneficial for the protection of the skeletal, nervous and cardiovascular systems. Copper deficiencies are seen in many third world countries and are reflected in a number of birth and growth defects in children of those nations. Helps Prevent Premature Aging. Copper is a strong antioxidant, which works in the presence of the antioxidant enzyme superoxide dismutase to safeguard the cell membranes from free radicals. Superoxide dismutase is one of the strongest antioxidants that work within the body in the fight against free radicals. Free radicals attack different organ systems but are specifically studied in terms of their effect on aging, including wrinkles, age spots, susceptibility to various types of cancer, macular degeneration, and kidney malfunctions. Having enough copper in your daily diet can keep you looking younger for longer! Helps Regulate Melanin Production. Copper is a vital component of the natural dark pigment, melanin, which gives coloration to the skin, hair and eyes. Melanin can be produced by melanocytes only in the presence of the cuproenzyme called tyrosinase, which is derived from it. Intake of its supplements also helps in protecting against the graying of hair, so while it is often overlooked as an antioxidant mineral, it does protect the integrity of those cells and helps to keep you looking younger! It also maintains the color of your eyes, and is essential, along with zinc, to keep your eyes beautifully colored into your old age. Skin Care. Copper is an important nutrient that plays a significant role in the synthesis of hemoglobin, myelin, body pigment melanin and collagen. It helps to protect the myelin sheath surrounding the nerves and is also actively involved in the production of elastin, that helps to keep the skin flexible. This also keeps your skin from looking older by keeping it flexible and less prone to sagging and wrinkles. Brain Stimulant. Copper helps to stimulant the brain, which is why foods rich in copper are often classified as “Brain Foods”. However, copper content in the diet has to be in adequate proportions. It has a control function to play in the brain, so the amount of copper has to be balanced. It has been associated directly with advanced thought processes, particularly in relation to the impact of its transporter protein, Atp7a. Studies have shown a direct link between its content within the brain and creative or out of the box thinking, showing that it helps neural pathways to develop in unique ways. Helps Increase Energy Production. Copper is essential for the synthesis of adenosine triphosphate, which is a place in the body where energy is stored until needed. When we have enough of this element in our bodies, we will have enough functional and accessible energy to get through the day without feeling lethargic or tired. Helps Prevents the Growth of E. Coli. Studies have shown that copper can prevent and destroy the growth of bacterial strains and viruses such as E Coli. It does this by boosting the immune system and preventing excess energy from being expended fighting off the infections. Helps Lower Cholesterol Levels. Studies have shown that copper can reduce the levels of LDL (bad) cholesterol and help to increase beneficial HDL (good) cholesterol. This lowers the chances of cardiovascular diseases like atherosclerosis, heart attack and stroke. Helps Improve Thyroid Health. Copper plays an important role in ensuring the thyroid gland is functioning properly. You must however not take an excess amount as it can lead to thyroid problems. Be sure to take a balanced level of copper as too much can throw your hormone levels out of balance and could lead to either hypothyroidism or hyperthyroidism. Promotes Formation of Red Blood Cells. Copper is essential in the production of red blood cells, hemoglobin and bone matter. This is because it is partially responsible for the efficient uptake of iron from food sources. We could go on and on regarding the benefits of copper in the human body however just the benefits listed above should give you enough information as to why you need to consider Copper 1 in your daily regime. We have researched the world's best sources for copper supplements and have found only one that meets and exceeds our expectations. 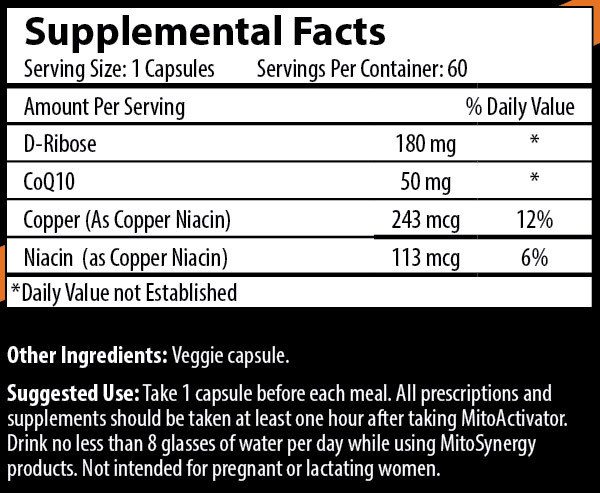 MitoSynergy Advanced Copper-1 Supplement is the world's only patented and true bioavailable copper 1 supplement. We encourage you to at least try this amazing product as it could change your life! Human energy boils down to a form of currency called adenosine triphosphate otherwise known as ATP. ATP is made within most cells of the body. ATP is made within the cell through three steps. Step one is glycolysis that yields 2 ATP. Step two is the Kreb’s Cycle that yields 2 ATP. Step three is the electron transport chain that yields 34 ATP. The greatest yield of ATP is found in the electron transport chain. Bioavailable copper is necessary for the electron transport chain to operate. The copper found in MitoSynergy is the world’s first bioavailable copper. It has become known that many of us are copper toxic and deficient at the same time. This seems like an illogical statement. But the fact is we have all been subjected to a non-bioavailable form of copper in our environment. The problem is further compounded by an ongoing depletion of essential minerals including copper in our soil. So our food sources are depleted of bioavailable copper. Inadequate levels of bioavailable copper in the cell impairs its ability to make ATP. When the cell is not making ATP it is making lactic acid; it is always doing one or the other. The cell is a pulsing machine. The cell is either happy or unhappy; living or dying, making ATP or making lactic acid. By simply increasing ATP and reducing lactic acid helps the body help itself reducing the discomfort. All brain processes and bodily functions are dependent on a currency called adenosine triphosphate otherwise known as ATP. The brain can perform at optimal levels with adequate supplies of ATP and with inadequate levels can impair mental clarity. MitoSynergy will assist the body to have increased ATP by providing a source of bioavailable copper. MitoSynergy is a one of kind dietary supplement that helps the body help itself by bringing a revolutionary copper chelate that has the ability to feed and charge the mitochondria. MitoSynergy has a unique bioavailability on a molecular level in the mitochondria. The most important quality of MitoSynergy is that it may help you in ways that no other product has the ability to help you. Can your body become dependent on MitoSynergy? Does MitoSynergy share customer information? No, all customer information is kept private. What ingredients are in the MitoSynergy Copper1 Supplements, which one should I take and how much should I take? MitoActivator LDS is ideal for someone just starting out with the MitoSynergy Copper1 Supplements. It is also the one recommended for children and pets. See label below for Suggest Use. MitoActivator Original Formula is where it all started and is the next level up from the MitoActivator LDS. Once your body has adjusted from taking the MitoActivator LDS (Typically One Bottle), it is ok to move to the MitoActivator Original Formula. See label below for Suggested Use. 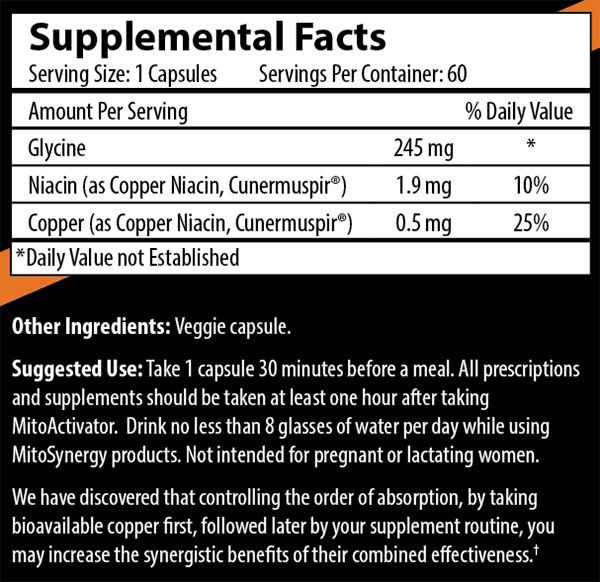 MitoActivator Extra Strength is the strongest Copper1 Supplement available. It is recommended for those who are very healthy (typically athletes or people who work out on a daily basis) and those who are very ill. If you are very ill, it is ok to begin with the MitoSynergy Activator Original Formula instead of the LDS. Just be sure to follow the Suggested Use below. The MitoSynergy Advanced is our Signature all-in-one neuromuscular health supplement. It is ideal for those who are currently not taking any other multivitamins or vitamin supplements. Although the label says 4 capsules per day, it is not mandatory in order to feel the benefits of this product. If you are new to this product, you should start out with 1 to 2 capsules per day. After several weeks, you can increase to 3 or 4 capsules a day however one or two may be just right for you and you may just want to stay at that level. As with all of the Copper1 supplements, the worse your situation, the longer it will take your body to regain balance. Once you are feeling better and have reached optimal performance, you can take one per day in order to maintain your health. Is MitoSynergy made in the USA? What is the meaning of the name “MitoSynergy”? 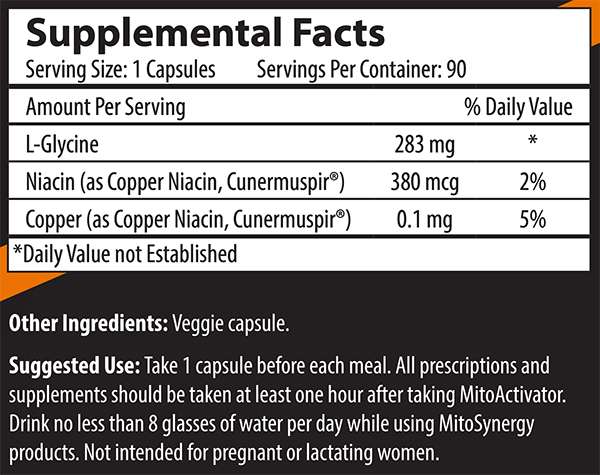 Mito is short for mitochondria and Synergy for the synergistic effect of the blend of the MitoSynergy formula combined with the unique ingredient Cunermuspir. Why is MitoSynergy so expensive? MitoSynergy and the Cunermuspir complex have required an enormous amount of investment. MitoSynergy products are priced with the minimal margins to keep the products at the highest quality and ensure product availability. However there is power in numbers. As more users find MitoSynergy, it is our goal to lower the price as quickly as possible. As production levels go up, we will be able to lower the price. Please help us by spreading the word. Where did MitoSynergy come from? MitoSynergy was created because a loving uncle was trying to help improve the quality of life for his 21 year old nephew, who injured his spinal cord and broke his neck leaving him a quadriplegic. The uncle searched the world for something to give his nephew hope. In his endeavors, he collaborated with doctors, scientists and chemists in the United States and abroad. Is MitoSynergy an all-natural product? How do I know if MitoSynergy is working for me? In order to see if MitoSynergy is working for you, we recommend that you begin a log for your reference that gauges current level of discomfort, energy level and mental clarity. Use a written or video diary prior to taking MitoSynergy as well as 30 days of taking MitoSynergy. This may help you to determine the improvements of the quality of your life. Those using the product have had surprising results in areas that previously they were unaware of. We greatly appreciate your sharing your experience with us as it helps us spread the word. Please share your experience with us! Email us at robert@nsearch.com with the word, testimonial, in the subject line. If you miss a dose, continue to take MitoSynergy as recommended. Do not take any extra. Can I take MitoSynergy if I am taking a medical prescription? Some dietary supplements may interact with other supplements or prescription and over-the-counter medicines. Taking a combination of supplements or using the products with medications (whether prescription or OTC drugs) can cause side-effects. Please consult your physician before taking any supplements of any kind. In order to receive optimum results and allow the unique ingredient to perform at its highest level you must take MitoSynergy two hours before any other minerals, vitamins, supplements and/ or any (OTC) or prescribed medications. MitoSynergy is not working for me. What should I do? It is imperative you consult with a MitoSynergy representative as soon as possible to ensure optimum results. Please make sure you are taking MitoSynergy thirty minutes before food. Drink plenty of water, at least 8 glasses daily. If you take prescription medications try taking MitoSynergy at least 2 hours before your prescription medications. Can I take while pregnant or breast feeding? Are there drug interactions with MitoSynergy? At this time there are no known drug interactions with MitoSynergy. We do recommend that you speak with your healthcare professional prior to beginning any supplement in order to minimize the risk of interactions and to improve the success of your therapy. In order to receive optimum results and allow the unique ingredient Cunermuspir to to perform at its highest level you must take MitoSynergy two hours before any other minerals, vitamins, supplements and or any (OTC) or prescribed medications. If taken when dehydrated you may experience a slight headache, which is why it is imperative to drink eight full glasses of water each day. As with any vitamin mineral or supplement you may experience some nausea if taken on an empty stomach. If you experience any nausea you may take with a small amount of bland food. You may see results within thirty days. If being taken for; nerve discomfort you may expect results in seven days or less, muscle discomfort results in 14 days or less, deep bone and joint discomfort results in 60 days or less. Each person’s unique body chemistry and situation may differ. In order to continue the benefits of MitoSynergy will I need to continue taking it? Is it ok for children to take? Yes, however the suggested use is for adults and children 12 or more years of age. For children younger than 12 years of age please consult your healthcare provider. Is there anything I can take with MitoSynergy to improve its effects? Yes. Our Green Tea Synergy Plus is an ideal addition to our copper one supplements. Green Tea Synergy Plus helps to increase energy, helps promote healthy weight-loss and helps to fight off colds and viruses. You can also improve your nutrition, drink plenty of water and consider some form of doctor recommended oxygen therapy, deep breathing and exercise. We offer a 30 Day 100% Money Guarantee if you are not completely satisfied with any MitoSynergy purchase from our website. Refunds will be given on one open bottle only. Refunds will not be given on multiple open bottles. Receive promotions, discounts and new product announcements directly to your email.